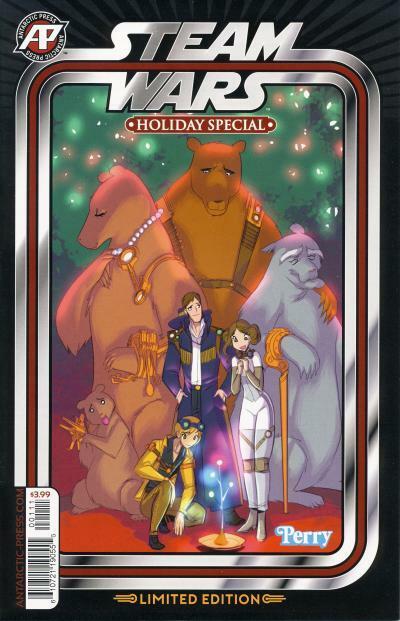 The Steam Wars Holiday Special comic cover is a unique pairing of Kenner Star Wars action figure packaging and the Star Wars Holiday Special imagery. Fred Perry, the creator of the Steam Wars comics, clearly is a fan of Star Wars. The cover for Steam Wars Holiday Special is laid out like a vintage Kenner Star Wars action figure package with the silver bands and black frame. Under the title is the placard where the character's name would go but here it says Holiday Special. Even Fred Perry's "signature" is done in the style and font of the Kenner name on the front of the vintage card backs. Inside that nostalgic cover dressing is art that reminds readers of the Star Wars Holiday Special. Characters from inside the comic book are designed after Chewbacca and his family on Kashyyk. In the middle back is the Chewbacca stand-in, with his arms around stand-ins for his wife Malla and his dad Itchy. At Mala's feet is their son Lumpy's stand-in, playing with a toy spaceship that looks very much like an X-Wing Fighter. The humans in front of the family represent Luke Skywalker, Han Solo, and Princess Leia. This comic was published in November, which is appropriate because the Star Wars Holiday Special was broadcast only once, on CBS on November 17, 1978. Howard the Duck is an interesting Marvel character. Played for laughs by his creator, Steve Gerber, Howard the Duck is an anthropomorphic duck who becomes trapped on Earth and has adventures that satire politics and society. Visually, the character has a striking resemblance to Disney's Donald Duck and even has Donald's grumpy disposition. 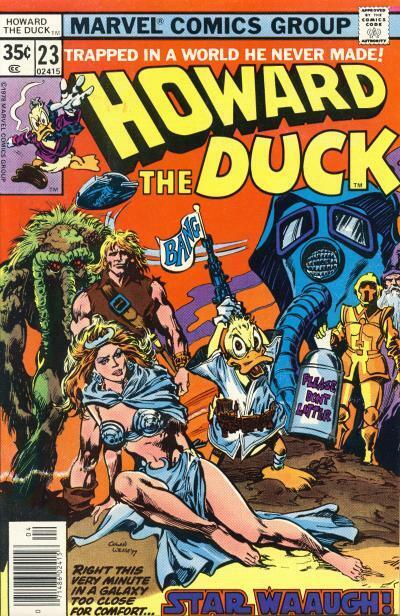 Howard the Duck #22 and 23 contain a 2-part story which parodies elements from Star Wars. The extent of the Star Wars references on the cover to Howard the Duck #22 is the blurb May the Farce Be With You! 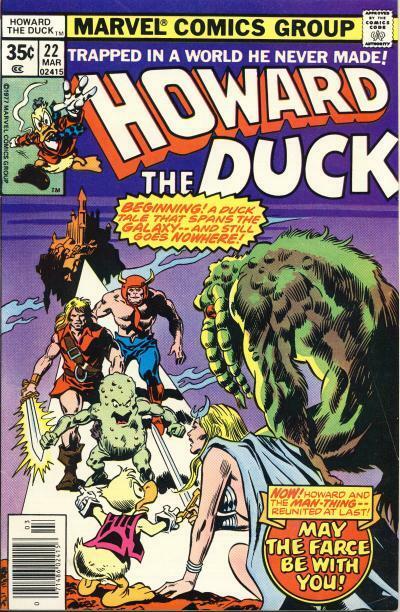 The cover for Howard the Duck #23 is more recognizable as a spoof of the Star Wars movie poster by Tom Jung and later the Hildebrandt brothers. Howard is dressed like Luke Skywalker and at his feet is Jennifer Kale in Princess Leia's pose. Korek the Barbarian is Han Solo and the Man-Thing is Chewbacca. The two droids are NAAC-3PO and 2-2-2-2, or Tutu for short. Behind the two droids is Dakimh the Enchanter and the helmeted villain is one of the Dearth Vapor henchmen of Bzzk'Joh. The blurb reads: Right this very minute in a galaxy too close for comfort... Star Waaugh! As you can imagine, much of the humor inside these two issues is dated and I found it a chore to read this story. Even so, I'm happy to add these relics from the 1970s to my Star Wars comic collection. Luke Skywalker: What's this blockade all about?! Princess Leia: I think the Empire is afraid, Luke. Luke Skywalker: Princess, no one's got more faith in Rebel fighting ability than me -- but I can't believe we've got the Imperial war machine paralyzed with fright! Princess Leia: That's not quite what I meant, Luke. But consider -- besides other earlier victories, we've destroyed their most awesome weapon... The Death Star! That's not the kind of news that makes it easy for them to control the galaxy. Luke Skywalker: Leia, you think the blockade is an attempt to keep that defeat secret? Princess Leia: Partly. By now, the Empire could have sent a massive fleet in retaliation --- but suppose our forces abandoned Yavin as they once did Dantooine? Or worse yet: pulled another victory out of the hat? That's what the Empire fears, Luke. After an encounter with mines laid by the House of Tagge Mining Explorer, Luke and Leia don spacesuits and observe the spacecraft from a small moon where they learn that the TIE Fighters are actually hiding in the gaseous atmosphere that makes up Yavin. The issue ends with the pair back aboard their now damaged ship, with information vital to the survival of the Rebel Alliance, under attack by TIE Fighters! 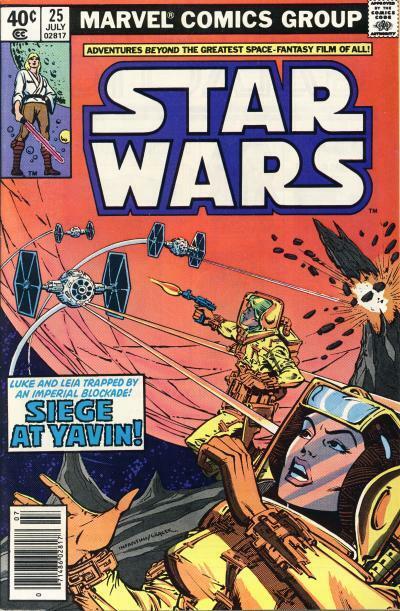 The cover to Star Wars #25 shows Luke and Leia in spacesuits being attacked by TIE Fighters. 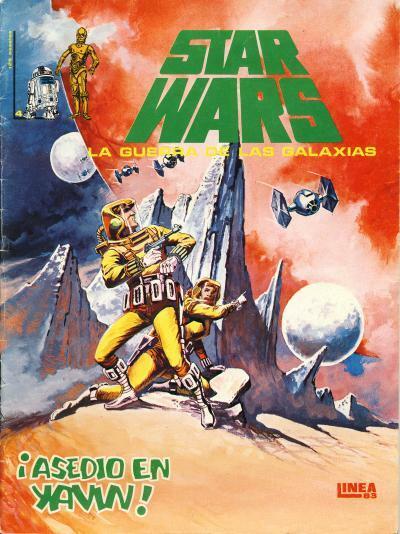 The cover to Star Wars: la Guerra de las Galaxias #4 published by Ediciones Surco is a similar image. Luke Skywalker and Princess Leia are easily recognizable on the cover to Star Wars #25. 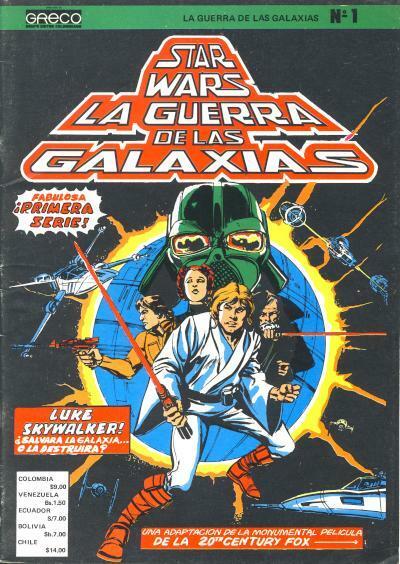 On the cover to Star Wars: la Guerra de las Galaxias #4, Leia is recognizable, but the male character looks nothing like Luke. Both the U.S. and the Spanish covers have the TIE Fighters drawn with small solar panels. This was very common for Carmine Infantino who was probably inspired by the Kenner TIE Fighter which has small panels, but the Spanish cover (not drawn by Infantino) has even smaller panels. On both covers, Leia is an observer, with Luke taking action with his pistol. I like the background on the Spanish cover, but the characters and ships on the cover to Star Wars #25 are better. Both covers depict a scene that does not actually occur inside the comic, but is representative of the peril our heroes are in. Overall, the U.S. cover is the superior cover, although these Ediciones Surco covers are cool because they are so unfamiliar to U.S. Star Wars comic collectors. 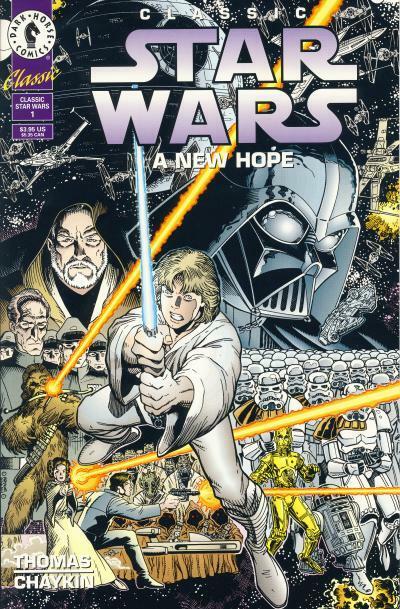 Arthur Adams is another artist who contributed a single cover to Dark Horse's Star Wars line. He is best known for the 1985 mini-series Longshot and his creator owned title Monkeyman and O'Brien. Extremely popular in the 1980s, Arthur Adams' influences include Michael Golden and Walter Simonson, both Star Wars comic alumni from Marvel's original series. His stylized artwork is easily recognized and he tends to put a lot of detail into his work. His females tend to have round faces, pouty lips, and are doe-eyed, another feature of his unique style. He provides the cover for Classic Star Wars: A New Hope #1, a prestige format comic that contains Marvel's Star Wars #1 - 3. 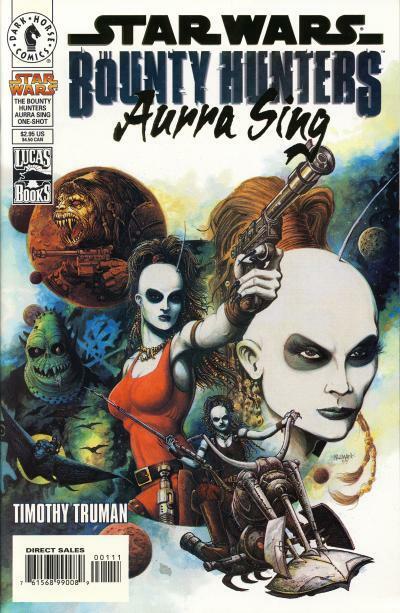 He was a founding member of the Legends imprint published by Dark Horse comics in 1994, which made him available to Dark Horse for this cover art. This Arthur Adams' drawn Star Wars cover is busy. 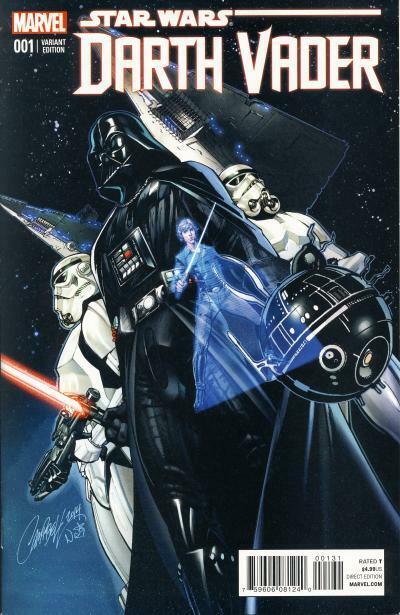 All the principal characters are shown, with Luke Skywalker front and center and the typical Darth Vader visage in the background. In addition to showing Luke, Princess Leia, Han Solo, Chewbacca, C-3PO, R2-D2, Obi-Wan Kenobi, and Darth Vader, we also have Grand Moff Tarkin flanked by Imperial Officers, Greedo, Tusken Raiders, Jawas, and a squad of Stormtroopers. And if all those characters are not enough, the cover also shows the Death Star, the Millennium Falcon, TIE Fighters, X-Wing Fighters, and Luke's Landspeeder. Arthur Adams also managed to squeeze in a star filled background. I like that he drew pauldrons on the Stormtroopers which identifies them as the Sandtroopers on Tatooine. 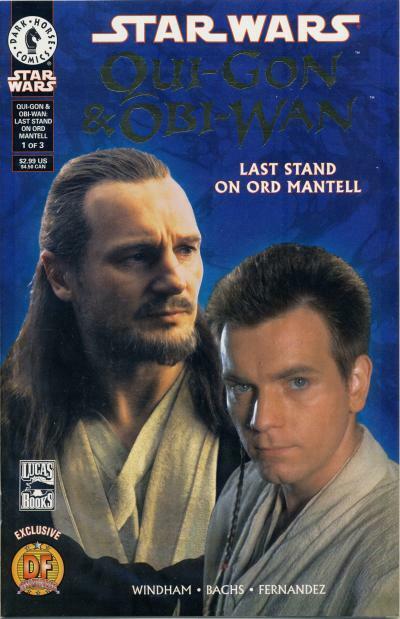 Star Wars: Qui-Gon and Obi-Wan - Last Stand on Ord Mantell is a 3-issue mini-series that started in December 2000. The first issue has three different standard covers and received a Dynamic Forces exclusive cover. The Dynamic Forces cover is a unique photo cover with parts of the title in gold foil. This exclusive was limited to 999 copies. 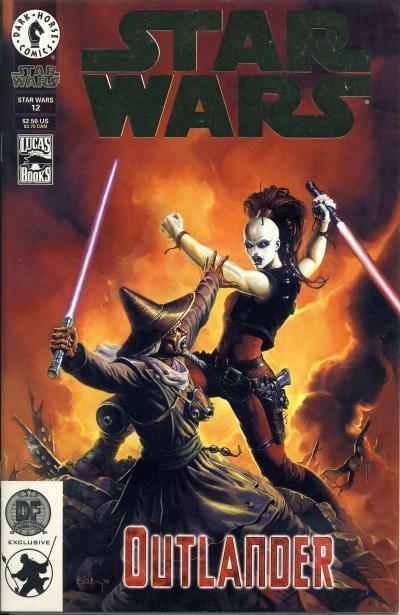 Like several of the Dynamic Forces Star Wars exclusives, there is a signed version of this comic that uses the same cover. The signed version is limited to 750 copies. Marvel Dumping Even More Star Wars Variants On the Market? Late last year, Mile High Comics had an email newsletter talking about them buying more of the early Star Wars variants from Diamond. It looks like Marvel is set to dump even more back issue Star Wars variants on the market for retailers. The article also talks a little about the impact publishing Star Wars comics has had on Marvel's other publishing plans. Please read the blog David Gabriel, The Prince Of Variants over at BleedingCool. And then read the original blog with even more Star Wars comic talk Marvel's David Gabriel On Variant Covers, Star Wars, Deadpool & More! over at comicbook.com. 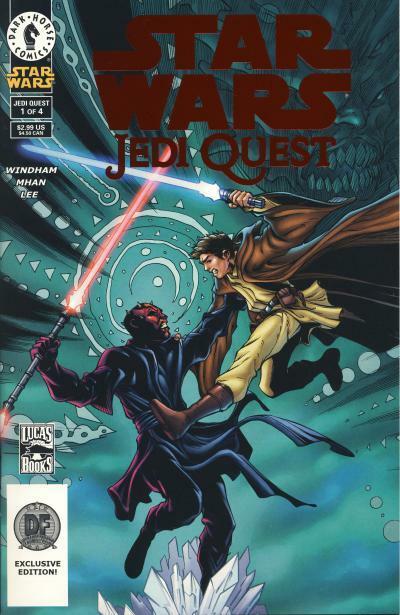 Star Wars: Jedi Quest is a 4-issue mini-series that started in September 2001. The first issue received a Dynamic Forces exclusive cover. The Dynamic Forces cover is the same as the standard cover, except the title is ruby red. This exclusive was limited to 1,500 copies. 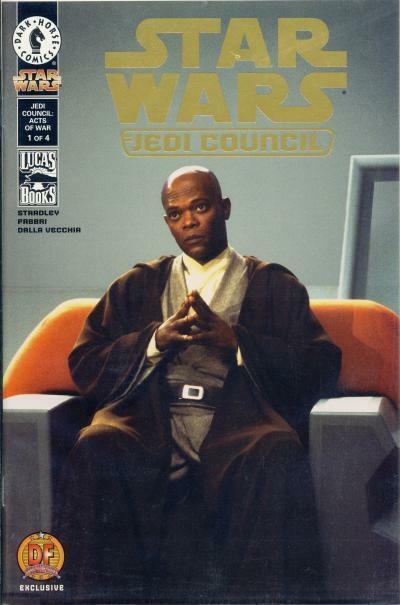 Star Wars: Jedi Council - Acts of War is a 4-issue mini-series that started in June 2000. The first issue received a Dynamic Forces exclusive cover. The regular version of this comic has an art cover where this Dynamic Forces exclusive has a photo cover and the title is in gold foil. At one time, one of the most inexpensive Dynamic Forces exclusive comics on eBay was Star Wars: Jedi Council - Acts of War #1. In the early to mid 2000s there were a few dealers that had what appeared to be an endless supply of this comic they were selling for $3 - 5. At the time, it might have be surprising to know that these were limited to 3,000 copies since they appeared to be as common as the The Phantom Menace Dynamic Forces exclusives which had four to five times the number of copies printed. J. Scott Campbell is an American comic book artist best known for his work on Gen13 and Danger Girl. He received his start in comic books working at Wildstorm Productions where he co-created Gen13 with Jim Lee and Brandon Choi. He helped found the Cliffhanger imprint of Wildstorm Productions where he created Danger Girl. In recent years, he has become mostly a cover artist, achieving notoriety with his covers for the Amazing Spider-Man. His artwork is distinctive and known for his long, thin figures. Campbell cites Art Adams as an inspiration for his work. 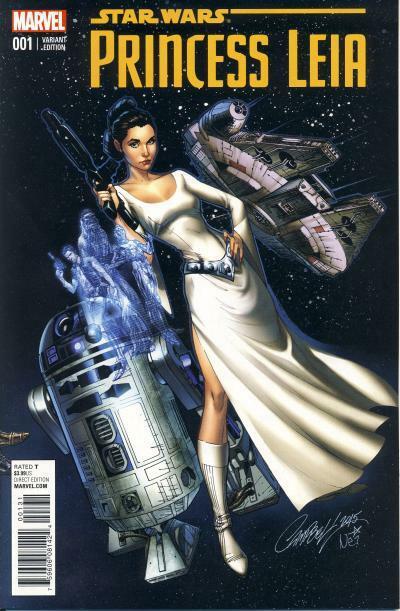 J. Scott Campbell created three connecting covers for Star Wars #1, Darth Vader #1, and Princess Leia #1. These covers are 1:50 incentive variants. 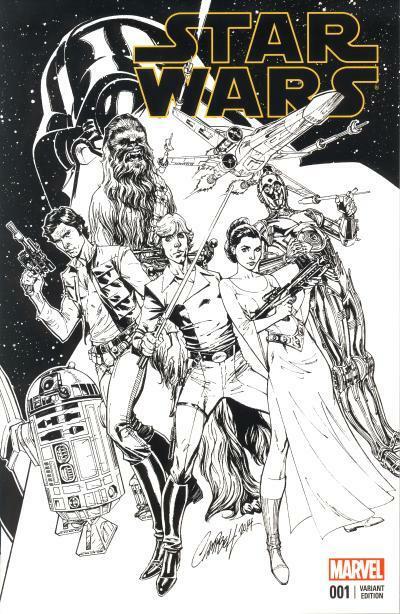 A black and white variant of J. Scott Campbell's cover to Star Wars #1 was used for the Four Color Grails exclusive. 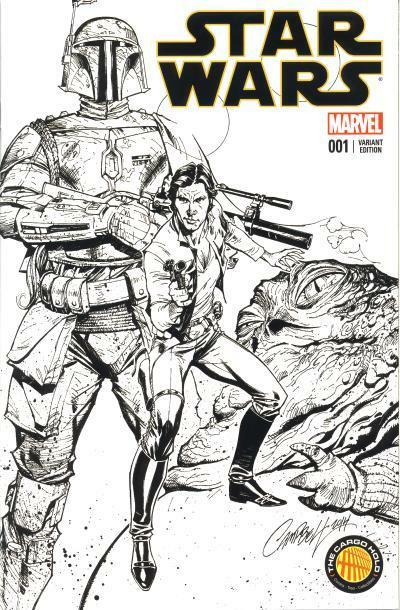 J. Scott Campbell also created a unique cover for The Cargo Hold exclusive for Star Wars #1. There is a 3000 copy color version and a 1500 copy black and white version. 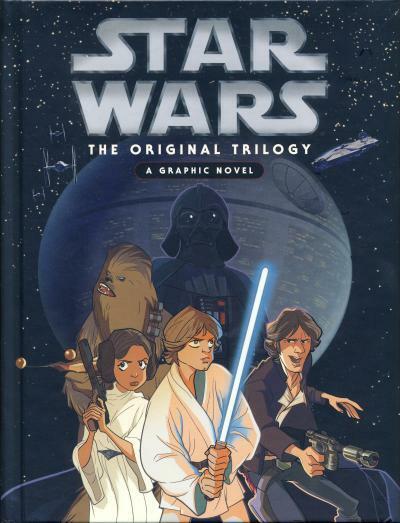 Star Wars: The Original Trilogy - A Graphic Novel hardcover collects the three original trilogy movie adaptations that were released individually overseas. 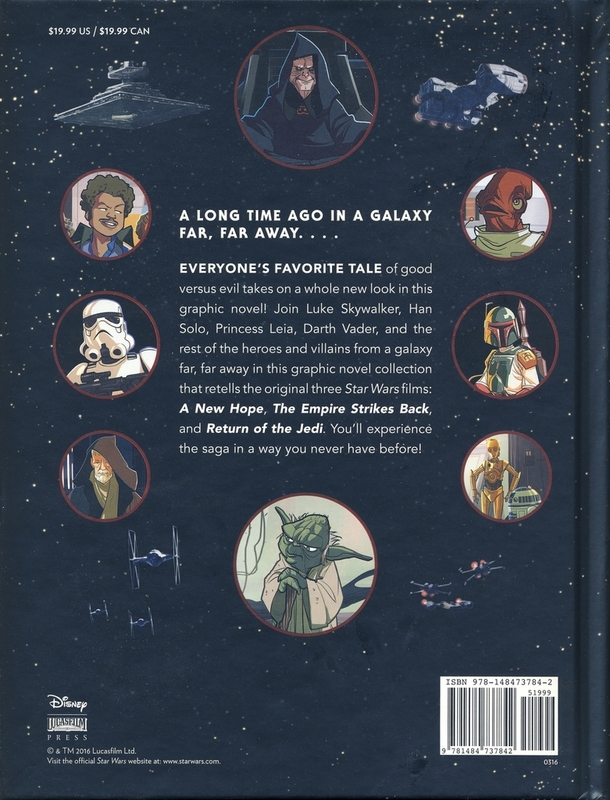 Featuring new art that is cartoony in comparison to Marvel's adaptations, this book is published by Disney-Lucasfilm Press, which specializes in publishing Star Wars books for younger readers. The pacing of the movie adaptations are not rushed, but this is made possible by judicious cutting of scenes from the movies. For example, when Owen Lars is buying the droids from the Jawas, R5-D4 is not even considered as Owen selects C-3PO and R2-D2 outright. Later, when Luke Skywalker is attacked by Tusken Raiders, the attack is quickly glossed over to make the story more child friendly. While the movie covers this attack quickly itself, in this book, we see a Tusken Raider with a raised gaffi stick in one panel, in the next Luke is shown gasping, and the next panel has the Raiders dragging Luke's body toward the Landspeeder. C-3PO is not involved in the attack, so the story skips the scene of Luke and Obi-Wan Kenobi gathering C-3PO and his arm after Obi-Wan chases the Tusken Raiders away. This sequence in the book captures the main elements from the movie, without getting bogged down in the details. Another example of the toning down of the story for children is the cutting of the scene with Obi-Wan coming to Luke's rescue in the Mos Eisley Cantina. It is hard to completely avoid the dark tone of the movies; it is still implied Darth Vader tortures Leia on the Death Star and Vader does choke Admiral Motti. The story uses elements from the Special Edition releases as well. For example, Greedo shoots first and we see celebration in a city when the Rebellion destroys the Death Star II, but Han Solo is not confronted by Jabba the Hutt in the hangar where the Millennium Falcon is parked in Mos Eisley. Overall, considering the audience these stories are aimed at, I found this new take on the saga refreshing and the art whimsical. The story does not devolve into the humor used in a Lego Star Wars production, but it adapts the movies faithfully without all the details. I like the simplicity of the sound effects. Explosions go BOOM and laser pistol PEW PEW. The character designs de-age the heroes slightly but they are all easily recognizable. The only character design I didn't like was Chewbacca's; his legs are a little too skinny for my tastes. A nice touch is each movie adaptation is proceeded by the famous opening crawls verbatim. If my kids were younger, I could see this being the book that I would use to introduce them to that galaxy far, far away. The Comics Chronicles released the February 2016 estimated sales earlier this week. The main two Star Wars titles took second and seventh place and two of the four issues rose in sales, but the average sale per issue is the lowest it has been since Marvel took over publishing Star Wars comics. Last month, we saw the Star Wars title lose over 15,000 units when comparing the issue prior to the Vader Down event and the issue after. It recovered almost 2,000 units this month. Also this month, the Darth Vader title lost just under 9,000 units when comparing November's Darth Vader #12, the issue prior to Vader Down, to Darth Vader #16, the issue after the event. Like the Star Wars title last month, that is a higher loss than the title has been trending. Overall, Marvel sold more issues with the event than they would have without the event, but at a slight loss to the ongoing sales numbers. I suspect Marvel is okay with that, because if sales drop too low, they can always use another event or restart the numbering on the titles to recover sales. To show how weak the comic market was in February, despite these drops, Star Wars #16 ranked second, up from fifth for the previous issue and Darth Vader #16 ranked seventh, up from ninth for the previous issue. Obi-Wan and Anakin #2 saw a standard second issue drop. Recall from last month, this mini-series had the lowest debut of the Star Wars mini-series to date. I expect this has a lot to do with the characters and the upcoming Han Solo mini-series will sell better. What is not known is how the upcoming The Force Awakens mini-series will sell. Movie adaptation have traditionally not been strong sellers. There is an trend with first appearances however that may help, and as long as the ongoing Poe Dameron title set to start in April does not contain more than a few first appearances, there may be some demand for The Force Awakens based on those movie characters who do see their comic book debut in the adaptation. But, there is also a stigma against comics based on movie properties. It will be interesting to see how that plays out. Kanan #11 rose an inconsequential number of units. Kanan #12 will be the final issue of this title which will be replaced by the Poe Dameron ongoing. The following table shows the total number of Star Wars units sold per month since January 2015 along with the average number of sales per issue. Note this chart does not include reprints. The average sale per issue would rank 11th on the top 300 chart for the month of February which is the same as last month. The Star Wars titles saw a large decrease in the average sale per issue from last month however. It is possible March will see another drop in this average due to no new event or a #1 being released. I do need to point out, that while this is true for pamphlets, this is not the complete picture for Star Wars comic book sales. The Star Wars trade paperbacks are selling well and reorders are strong. Please read the blog posting February 2016 comics sales estimates online: Dark Knight III #3 tops 146k copies. Steam Wars: Bounty Hunters #1 and 2 continue to showcase characters that are based on character visuals from Star Wars while telling a unique story. 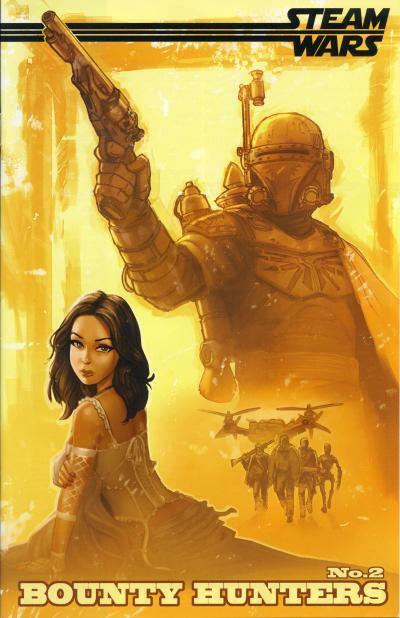 The main bounty hunter character shown on the cover to Steam Wars: Bounty Hunters #1 is clearly based on Boba Fett. The helmet, backpack, antenna, shoulder cape, and emblems all make it clear who this character is. The female chained in the foreground is meant to evoke images of Princess Leia as Jabba's captive. The droid has a striking resemblance to IG-88. 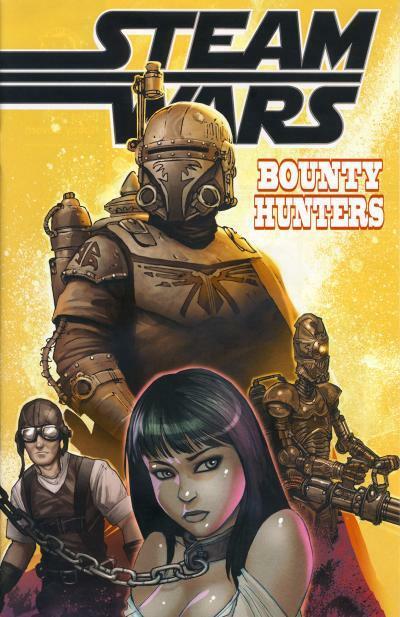 The cover for Steam Wars: Bounty Hunters #2 is very similar to the first cover. The colors are more washed out. The main bounty hunter character has raised his gun and the female is no longer chained. A companion to Star Wars: The Bounty Hunters - Aurra Sing, the Star Wars (1998) #12 Dynamic Forces exclusive also features Aurra Sing. The Dynamic Forces cover uses the same art as the standard cover but the Star Wars title is in gold foil. Like the Star Wars: The Bounty Hunters - Aurra Sing Dynamic Forces exclusive, this exclusive also came out in 1999 and is also limited to 4,000 copies. It has traditionally not been a hard comic to find for sale on eBay at a reasonable price. Aurra Sing is one of many background characters in the Star Wars movies. Her brief three seconds in The Phantom Menace and cool visuals captured fans imagination not unlike the bounty hunters seen briefly on the bridge of the Super Star Destroyer Executor in the Empire Strikes Back. Although she never appears again in a movie, she has been explored in the Expanded Universe, most notably in comics books and the Clone Wars animated show. Star Wars: The Bounty Hunters - Aurra Sing is the first one-shot in a series of three that focus on bounty hunters. The one-shot received a Dynamic Forces exclusive cover. The Dynamic Forces cover uses the same art as the standard cover but portions of the title are in gold foil. This exclusive came out in 1999 and is limited to 4,000 copies. It has traditionally not been a hard comic to find for sale on eBay at a reasonable price. It is hard to believe, but the Star Wars and Darth Vader titles have weathered Marvel's new superhero title avalanche very, very well. While most of Marvel's new superhero titles see a first issue in the top 10, they have all mostly dropped out of those coveted positions the subsequent months. In February 2016, Star Wars #16 actually jumps to second place and Darth Vader #16 moves up to seventh place. Head over to The Comics Chronicles to read more. A battered and bloody Chewie regained his footing, stood up high on one pile of rubble, and faced the descending moon with arms upraised and a defiant roar. The scene receded quickly, but Han kept his eyes locked on the spot, burning that image of the very last moments of his friend's life indelibly into his consciousness. And then he saw the beginning to the final cataclysm as Dobido plowed into the city. The landing ram rose suddenly, locking into place - Han knew it to be the doings of his son - and then the Falcon went spinning away as the shock wave hit her. Han didn't even consider the danger to him and the others, not even to his son at that critical moment. He just thought of Chewie, of that last tragic image, the Wookiee shaking his fist at the great, unbeatable enemy. A fitting last pose of defiance, but one that did nothing to mend the tear ripping through Han's heart. Chewbacca died. In the pages of Vector Prime, published in October 1999, Del Rey shocked Star Wars fans with the death of a major Star Wars character. Vector Prime is the first in the New Jedi Order series of books that would see new invaders from another galaxy, the Yuuzhan Vong, appear in our beloved Star Wars galaxy and shake up the status quo. They came equipped with organic, alien technology and a physiology that rendered them invisible in the Force. They brought the New Republic, the galactic government after the fall of the Empire, to its knees and killed untold numbers of sentient life on worlds throughout the galaxy. And they used their technology to pull the moon Dobido, into the planet Serpidal, where Chewbacca saved many inhabitants as well as Han Solo's son, Anakin Solo, before meeting his ultimate fate as the moon and planet collided. Unlike Han Solo's death in The Force Awakens, the impact of Chewbacca's death is addressed in Vector Prime as well subsequent books in the series. 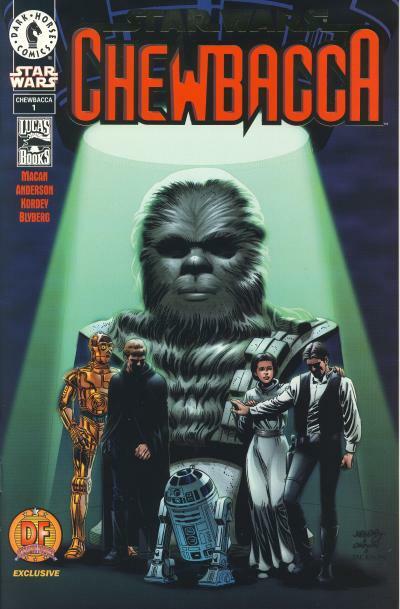 Dark Horse even celebrates our favorite Wookiee with a 4-issue mini-series title Star Wars: Chewbacca in January 2000. The first issue has a Dynamic Forces exclusive cover. The Dynamic Forces cover to Star Wars: Chewbacca #1 has different art and the title is adorned with gold foil. This exclusive is limited to 2,500 copies. The art has the principal heroes, Luke Skywalker, Han Solo, Princess Leia, C-3PO, and R2-D2 in front of a bust of Chewbacca. Leia is consoling Han, who is hit hard by the death of his best friend. It is a nice cover for a poignant series that delves into the characteristics that make Chewbacca a beloved character. Obviously, Chewbacca's death has been reversed in the new continuity and it looks like Chewbacca has been positioned to be the co-pilot for Rey in the new movies. One can only hope that Han's death is handled with the same care as Chewbacca's death was in the Expanded Universe. The next Star Wars mini-series from Marvel is Han Solo. The series will take place between Star Wars and The Empire Strikes Back. It is unclear if this mini-series will be released after The Force Awakens adaptation or not. Please read the post The Next Solo Star Wars Series Is Han Solo…. 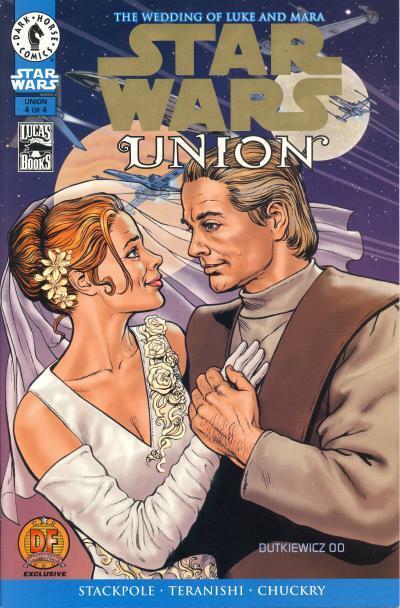 Star Wars: Union is a 4-issue mini-series tells the story of Luke Skywalker and Mara Jade's marriage. The first and fourth issues have Dynamic Forces exclusive covers. The Dynamic Forces cover to issue #4 has different art than the standard cover and the Star Wars title is in gold foil. This exclusive came out in 2000 and is limited to 5,000 copies. In comparison, most of the Star Wars exclusives published last year had print runs of 3,000 copies. Despite the print run, this is a moderately expensive comic and comes up for sale infrequently. Dark Horse would start 1992 by publishing Star Wars: Dark Empire #2 in February which continued bimonthly until it's final issue in October. 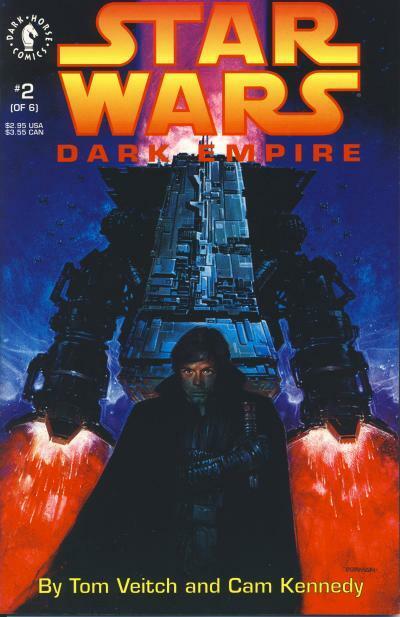 Like previous licensed movie properties, Dark Empire was a hit for Dark Horse and they went back to print on the first three issues. Arguably, Star Wars: Dark Empire is the most important Star Wars title published by Dark Horse. It presents a serious Star Wars story that logically follows where the movies left off. For Dark Horse, it lays a solid foundation on which the rest of their Star Wars line would follow. Nar Shaddaa, the Smuggler's Moon, is introduced in the Dark Empire story, but more importantly for Star Wars comic fans, so is the Jedi Holocron. The Jedi Holocron introduces characters and events that Dark Horse will exploit when exploring new eras in the Star Wars timeline. In August, the same month Dark Horse published Star Wars: Dark Empire #5, Classic Star Wars #1 was released. 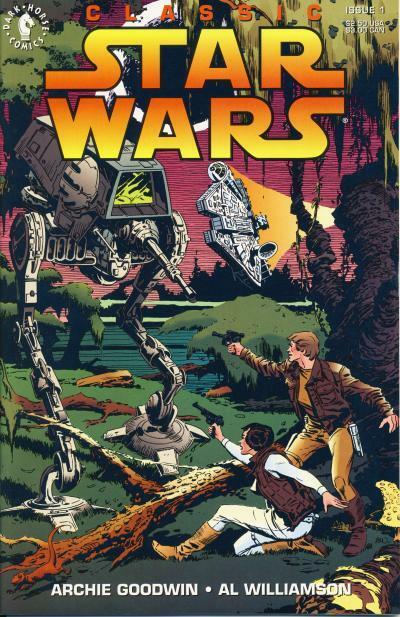 In 1991, Russ Cochran Publishing published a 3 book hardcover set that collects the Archie Goodwin and Al Williamson Star Wars comic strips from 1981 to 1984 in their original black and white format. Classic Star Wars contains the same comic strips, except they are reformatted and colored. Additionally, Al Williamson supplied new art to ease the transition from comic strip to comic book format. 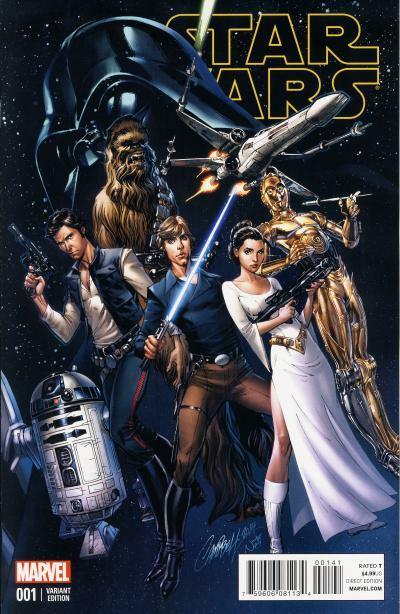 Classic Star Wars titles that reprint previous newspaper comic strips or Marvel comics, become a staple of Dark Horse's Star Wars comic offerings for a few years. Dark Horse would finish the year by publishing Classic Star Wars #5 in December. It is interesting to note that the Dark Empire title is priced at $2.95 and the Classic Star Wars title is priced at $2.50. The Dark Empire issues comes with a thicker, cardboard cover stock which allowed Dark Horse to justify the higher price. This was an era in comic publishing where it was common for publishers to raise cover prices based on cover gimmicks. A heavier cover stick is not the most grievous gimmick and it does lend a air of importance to the first Dark Horse Star Wars title. Bloch Editores published Portuguese translations of Marvel comic books in Brazil during the 1970s. 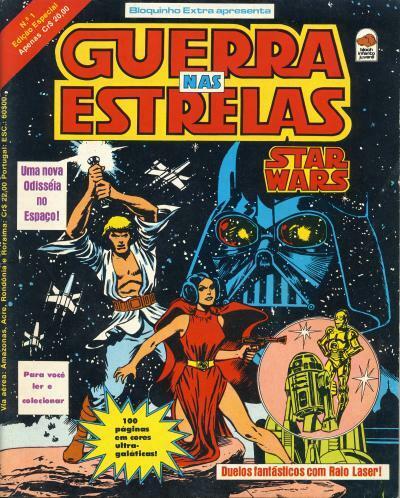 In 1978, they published the 100 page, magazine-sized Guerra nas Estrelas. 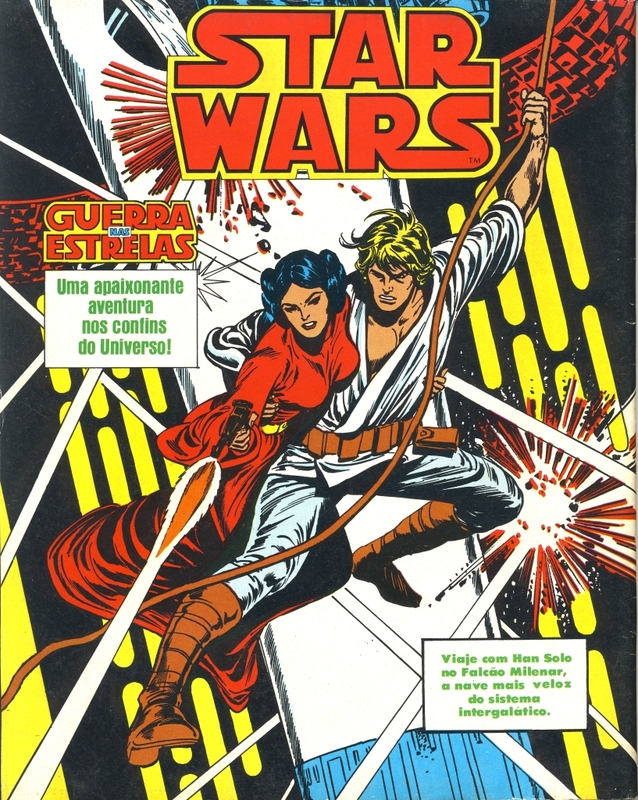 The cover for Guerra nas Estrelas is the same cover used for Marvel Special Edition #1. It has an inset drawing of C-3PO and R2-D2 which looks out of place on the cover. 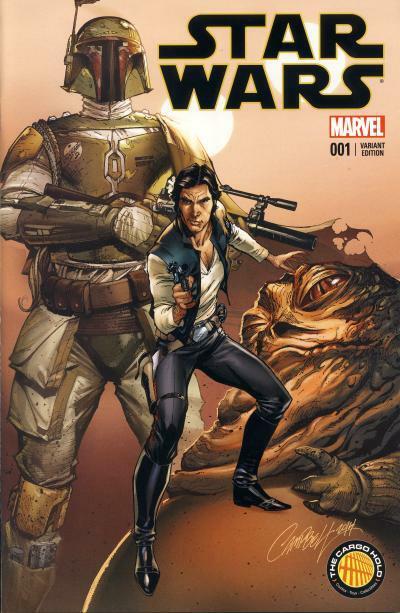 The first Star Wars issue from Marvel was rushed and the interior art by Howard Chaykin is very poor compared to the other 5 parts of the movie adaptation. 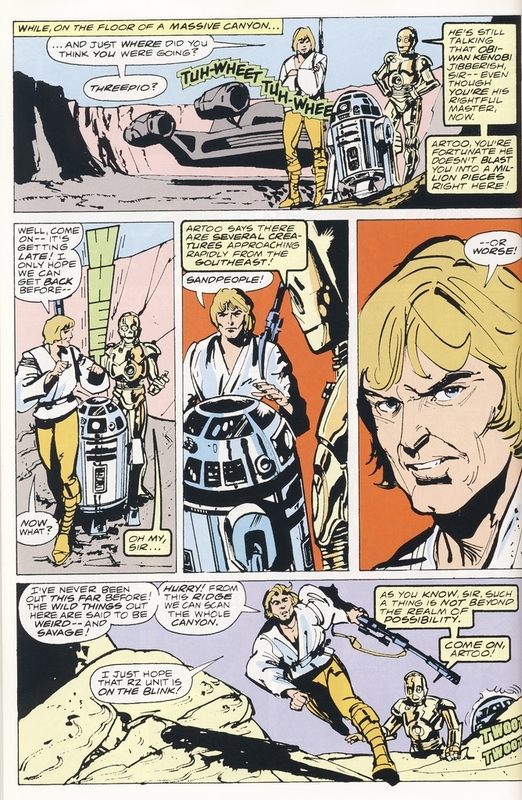 The drawing of C-3PO and R2-D2 is taken from the first panel on page 16 of the first issue. A better picture of C-3PO and R2-D2 could have been chose from later in the adaptation which better matches the clean, polished art of the cover. In addition to the inset, there are some interesting color choices made on both the cover and the interior. Luke Skywalker's pants are a light blue on the cover and change color between white and light blue on the interior. On the cover and the interior, Princess Leia is wearing a red gown. In the interior, Darth Vader's torso is pink with a yellow helmet and yellow legs. Stormtroopers change color from pink to yellow to white to yellow helmets and pink bodies. Obi-Wan Kenobi's cloak is the same read as Princess Leia's gown. R2-D2 is yellow. Han Solo's signature shirt is pink. When Luke and Han break Leia out of the detention block, they are wearing armor that has red gauntlets and boots, brown belts, and blue pants. To say the comic is wildly and inaccurately colorful is an understatement. It reminds me quite a bit of the color palette used on the Yugoslavian translation of these issues.